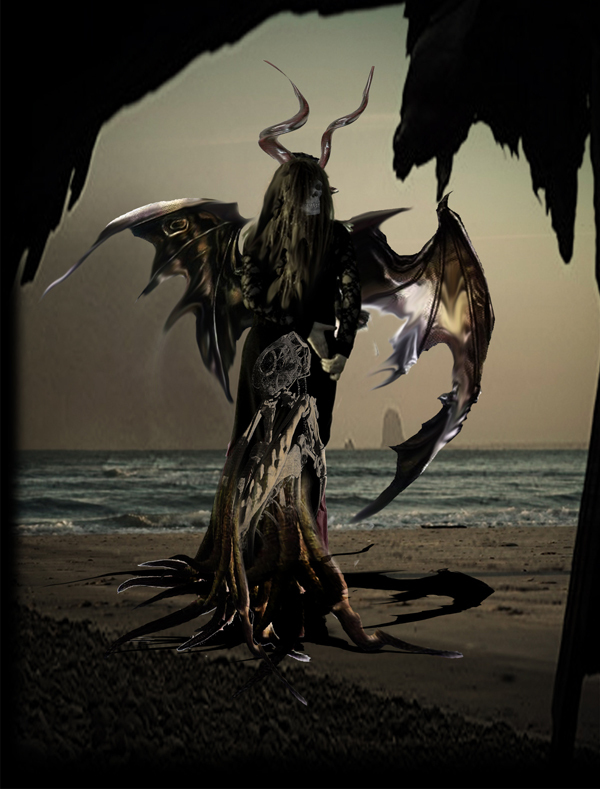 Artist rendition of the evil Sea-Queen who haunts Dark Harbor. The crustaceous crew of the Queen Mary Dark Harbor muse over their long-term plans for sailing full-steam ahead, into the future, hopefully overtaking their Halloween competitors in the process. The venerable Queen Mary has been in the spooky seasonal business for long enough to make it one of the most popular Halloween events in Los Angeles, and yet is reputation among fans has often placed it in the "also ran" category behind the big theme park attractions Halloween Horror Nights at Universal Studios Hollywood and the Knotts Berry Farm Halloween Haunt. 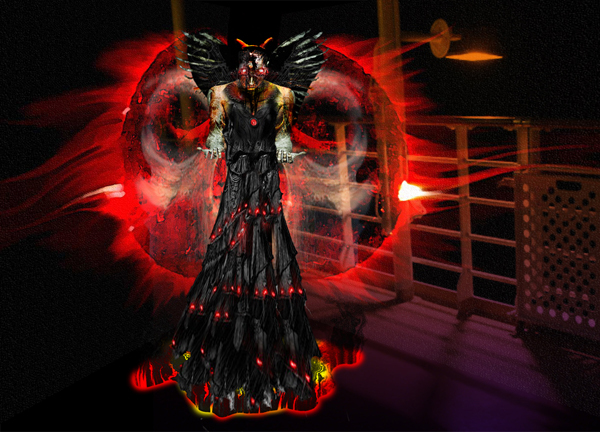 At least part of the reason for this second-tier status was the obviously lower budget accorded to the Queen Mary Shipwreck's annual Halloween Terrorfest (as the event was then known); in spite of this, the ship itself - with its lengthy iron corridors, dank and dark - provided all the production value needed, resulting in a unique ambiance unmatched by any other Halloween haunts in Los Angeles. The question, then, was whether the Queen Mary would continue sailing at an even keel, or would it pick up speed and overtake the competition? In 2009, the ghostly ocean liner seemed seriously in danger of running aground: Shipwreck Productions, the company that had piloted the annual Halloween horror festivities, was abruptly asked to walk the plank, and acting students from nearby California State University of Long Beach were pressed into service; the result, renaned The Haunted Queen Mary, was interesting and different, though inevitably flawed (with obviously young faces attempting to impersonate grizzled pirates and mummified corpses). Despite whispered rumors that the Haunted Queen Mary event might turn out to be the ship's last Halloween cruise, 2010 saw a new crew installed, including Tom Cluff and Robert Koval, whose combined experience includes stints at Knotts Scary Farm and other Halloween theme park attractions. The goal, as expressed by Queen Mary representative Paul Haught, was to relaunch the newly rechristened Queen Mary Dark Harbor as a challenger to the supremacy of haunts at Knotts Berry Farm and Universal Studios Hollywood. The result featured spooky on-ship mazes supervised by the crew responsible for the popular Sinister Pointe haunted attraction in Brea. There was also an effort to create an immersive environment in and around the ship, creating the illusion that one had entered a haunted world even before one climbed aboard ship. As a maiden voyage, the Queen Mary Dark Harbor's 2010 presentation was impressive but record-breaking. The scares were there, but the intended destination experience - offering a Halloween hang-out where one would want to remain even after experiencing the mazes - did not come off. And yet, as a dedicated sea-salt and long-time lover of the Queen Mary's Halloween events, in all their various guises, I hope that 2011 sees Dark Harbor in full glory. All of which brings me to this: Last year, in preparation for the Halloween season, I sat down for an interview with the crustaceous crew of the Queen Mary Dark Harbor. We talked mostly about their plans for 2010, but toward the end of the interview, we segued into a discussion of ideas that had not been implemented, for various reasons (time, money, logistics) but which might be resurrected from the catacombs and restored to horrifying unlife in future voyages. This interview was posted in October of last year, but since the final portion of the discussion acts as a sort of preview of 2011, I am re-posting the excerpt below. HOLLYWOOD GOTHIQUE:You have a long-term plan for building up Dark Harbor from year to year. TOM CLUFF: We’ve got the center [Hell's Bell Tower] that we’re building from, and we’ll add more things over the years. When I worked at that other place [Knott's Berry Farm] …we grew a thousand fold in four years, and I can see the same thing happening here. To build something like that again – but something completely different that’s built for the aughts ['00s], if you will – there is just something about that like it’s "Chance Number 2." What’s in store for us in the future, not just in terms of mazes but of developing the Dark Harbor back story? You must have had ideas this year that you were not able to implement, that will be used next time. Anything in particular stand out? TOM CLUFF: For me, as someone who believes in the future and wants to know what direction everyone is growing, it’s really answering certain questions, like: “Why do you walk through a maze?” Do you have to walk through? Is there a way to move the maze around you while you remain stationary. Is there a way to move you a space that isn’t normal?” We started working on that idea this year; the problem was the science side of that – the safety issue – takes more than a few months to put together. Those are questions we have aggressively tried to answer. PAUL HAUGHT: It’s thinking outside the box. What’s new? What’s the next big thing? That’s what Tom and his team have been good about: locking in this year while thinking about what to do next year. TOM CLUFF: The icons [Hell’s Bell Tower, the Barricades, etc] are going to be there every year, so let’s engineer it so that we can build it every year. There are a lot of these issues; we wanted to make sure those are addressed. ROBERT KOVAL: We gravitated here because it was clear they were serious about creating a quality event. They let us say, ‘We’ve got this great idea. We know we can’t do it this year, but can we at least vet it out?’ They allowed us, so we could build this year with some of idea of where it could go next year, so that we don’t have to jumble the entire event. That’s something I’ve most appreciated about Paul and his team. TOM CLUFF: It’s like any master plan for the future: we have left the holes for expansion. And it’s not just leaving room to build more; it’s to push the ‘weird’ envelope. One of the ultimate goals for me is to turn this into a huge art fair by day, so that it has a different quality. That’s one of the things I have to thank the Queen Mary for, because they have allowed us to think in a different direction. Whatever the new movie is, we know that’s going to go to Universal, and it’s the same thing at Knott’s: we have an idea what they’re going to put in the barn. It’s not that we know, but you have a sense because of the longevity. Now we have a chance of building something new so that you won’t know what’s coming up. PAUL HAUGHT: We’re not tied to a movie or a property. We’re free to come up with any attraction we like. We’re not constrained other than by the history of the Queen Mary, which will always be respected. Okay, Tom, you caught our interest. How else would you move people through a haunted attraction? TOM CLUFF: Let me put it this way: I am not opposed to putting everybody on an auto-crawler, one where you lie on your back. I’m not opposed to putting everybody in a wheelchair. I’m not opposed to putting people on roller skates or a moving escalator. These are all things to explore: how to do that safely but in a scary format? How do you do an event that happens around you? We have ideas, but there is a certain to this that you have to try beforehand, so it’s for next year. I can certainly see the potential. Even something as old-fashioned as the Los Angeles Haunted Hayride has its own unique effectiveness, because you cannot set your own pace, and you cannot avoid the monsters looming in the road ahead of you. TOM CLUFF: That can make a surprising difference. But the problem there is, you’re on a trailer, being pulled by a tractor, with a half dozen of your friends, and what’s happening to them on one side is not what’s happening to you. I’m trying to figure out, ‘What’s the personal mode of that?’ We can’t give everybody Segues. ROBERT KOVAL: Or can we? TOM CLUFF: We’re trying to find those answers. It’s a ‘stay tuned’ kind of thing. I know we’ll do something. Part of the thing is by taking away your normal sphere of influence, I can create more fear. One of the best ways to do that is to take away your control of movement. We all know the psychology: white room, dark room – you naturally walk into the white room. But we’ll force you to go into the dark room. Halloween 2016 Review: Backwoods Maze is back! October 22, 2016 Steve Biodrowski, Administrator Comments Off on Halloween 2016 Review: Backwoods Maze is back!